Conjunctival inflammation (conjunctivitis) is often due to infection with bacteria or viruses. It may also be due to allergy or it may occur in association with blepharitis (blepharo-conjunctivitis) or in response to dry eyes. 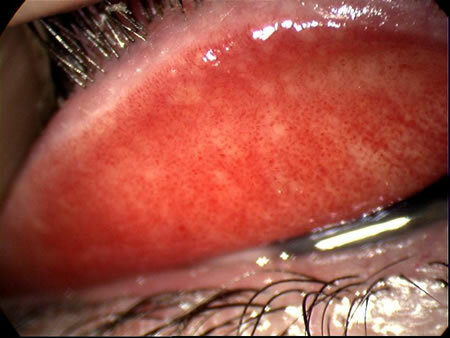 Infective conjunctivitis typically affects both eyes. The eyes are sore, red and gritty but vision is unaffected. A pus-like discharge is often present with bacterial infection, a watery discharge with viral infection. There is generalised inflammation of the conjunctiva but the cornea is normal. Viral conjunctivitis may occur with or following a viral throat/nose infection and the lymph glands of the neck may be enlarged. Antibiotic eye drops are used for bacterial conjunctivitis. They are ineffective for viral conjunctivitis though may be used if there is doubt about the cause. Infective conjunctivitis is contagious and care needs to be taken to avoid spread to others. See ophthalmologist if there is failure to improve, pain or reduction of vision..